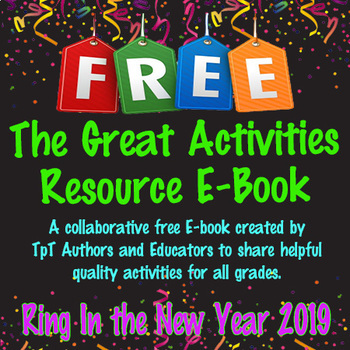 A FREE 49 page resource e-book from TpT Sellers offers links to free and paid resources for all grade levels and spanning multiple curriculum. Copyright 2018 © by Activities to Teach and participating TpT Authors as indicated on their individual pages. All rights reserved by author. This product is to be used by the original downloader as a resource. They are welcome to share the free resource with others but may not modify, change, edit, or recreate any part of this free product without the written consent of all parties contributing to its creation. This product may not be distributed or displayed digitally for public view. Failure to comply is a copyright infringement and a violation of the Digital Millennium Copyright Act (DMCA). Clipart and elements found in this PDF are copyrighted and cannot be extracted and used outside of this file without permission or license. Intended for classroom and personal use ONLY.